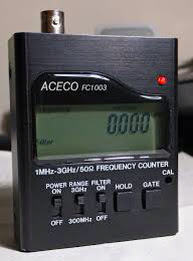 The Aceco FC-1003 hand-held frequency counter is a more practical counter, even advanced features such as field strength measurement are incorporated. It is compact, truly pocket sized, test instrument designed for ease of use and dependable performance. Supplied as a complete with internal NiCd pack, AC wall charger and 7 section telescopic antenna. how much is the aceco fc1003?